Service. Quality. Reliability. These are the genuine characteristics that separate Perfection Architectural Systems apart from other companies that offer aluminum canopy solutions in Texas. Every canopy constructed is an ongoing commitment to superiority and outstanding workmanship-not just viewing a canopy as another project, but as a lasting partnership. Perfection Architectural Systems strives to provide expertly engineered, long term solutions for professionals ranging from facilities owners to architects and building contractors. Perfection Architectural Systems has garnered a reputation as a premium manufacturer of aluminum walkway covers, canopies, and sun control systems. These engineering solutions are not only offered in Texas, but also nationwide. Solutions include custom walkway covers, solar framing, trellises, pavilions, carports, and many other options. With a proficient attention to detail and exceptional, reputable service, Perfection Architectural Systems guarantees the satisfactory result of your project. Perfection Architectural Systems recognizes the importance of building structures in Texas that keep the environment in mind. The EPA estimates that buildings account for 68% of total electricity consumption and 38% of carbon dioxide emissions in the United States. Perfection Architectural Systems believes that by implementing green building strategies, economic and environmental performance can still be maximized. By following this green standard, nearly all of the aluminum canopies constructed by Perfection Architectural Systems are still in use today. 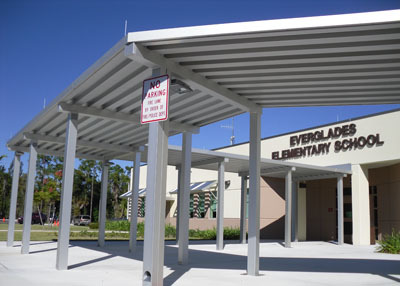 Perfection Architectural Systems offers aluminum canopy systems that will stand the test of time while still considering the future of our environment. Since our founding in 1993, the quality of workmanship and ability to assist clients diligently from start to finish has never diminished-it has only improved. Call Perfection Architectural Systems today at (800)238-7207 and get your next project in Texas started. Constructors, Inc. was fortunate to have Perfection Architectural Systems, Inc. as a major contributor to those goals. I look forward to working with you on a future project." View a map of many of the Perfection Architectural System Project Locations. Copyright © 2013 Perfection Architectural Corporation, All Rights Reserved.